Summer’s here and the harvest is coming thick and fast. In my tiny shared garden space, my Blue Jade dwarf corn is fattening up, one blue ear per stalk. The beans are busting the vines, and tomatoes are ripening daily. Yet even as the heat wave continues, the days are already shrinking. It’s dark before 9:00 pm and the mornings are closing in. As we pull spent lettuces and dig potatoes, we’re prepping for fall planting by mulching with aged compost watered with compost tea to refresh the soil. We’re making room for winter greens, including rosy arugula, which offers pretty much continuous harvest through autumn into deep winter. If given a cloche or a hoop tunnel, you can pick arugula on into spring. Same for many lettuce types, notably bibbs and butterheads such as Victoria, and Optima Buttercrunch Bibb. Of course, the classic cool season lettuce is the French favorite, Merveille des Quatre Saisons, but I’ve also had great crops of Pomegranate Crunch, a mini red Romaine. Endive crops through autumn as well. Frizzy, green-to-ivory Benefine is famed for being slow to bolt in summer heat but it’s also a fine cool season grower, as is smaller-headed Rhodos. Mustard greens are both tasty and pretty enough for the ornamental border, especially Osaka Purple, with rounded, puckered burgundy leaves, and Miz America, a fluffy, deep red confection with mild, almost sweet leaves. If I didn’t love the flavors, I would grow Swiss chard just for the beauty of the stems, from the warm gold of El Dorado to shrimp-tinted Flamingo Pink, citrusy Orange Fantasia and sparkling Magenta Sunset. Can’t choose? Try the Aurora blend, which offers a little of everything! Long considered peasant food, kale boasts dozens of beautiful, tasty forms that can be harvested pretty much year round. Over the past decade, kale won a place in the trendiest of kitchens, especially in gorgeous forms such as Beira, a Portugese Sea Kale with large, tender leaves of jade green ribbed in ivory. The thick ribs are as crisp as celery, while the leaves, sliced into chiffonade, are delicious in soups and stir fries. Brilliant grass green Prizm won awards when introduced in 2016 and no wonder; the almost stemless, super curly, cut-and-come-again leaves are excellent raw or cooked. I also love Oregon-bred Dazzling Blue, partly because I like the song (thanks, Paul Simon) but mostly because it’s amazing; blue-green foliage with bright pink ribs tastes as sweet as its lacinato parents. There are plenty of root crops to tuck in now, including Bull’s Blood beets, with ruddy leaves and fat round red globes. Purple-red MacGregor’s Favorite are almost carrot-shaped, while Touchstone Gold beets are orange skinned and yellow fleshed and gifted with abundant phytonutrients (a welcome new direction in plant breeding). Crisp, sweet-with-a-bite turnips do well as a fall crop, especially Japanese-bred Tokyo Cross and Hakurei, exceptional in raw salads and stir fries or quick-pickled with rings of red onion and a clove of garlic. Broccoli has a zillion varieties, many of which will produce tender side shoots all winter after the main head is harvested. Arcadia is a dense, medium-headed form with purple-tinged beads and a delicious flavor. Bred for the Pacific Northwest, Green Gold produces firm, tender heads in about 100 days, while blue-green Marathon heads up even faster (68 days from transplanting) and kicks out succulent side shoots until spring. A star in summer, Summer Purple keeps on keepin’ on, producing bright purple broccolini-type heads all fall. Sturdy, deep green Umpqua is another productive variety that cranks out tender side shoots long after the main head is harvested. Those little side shoots can be steamed, grilled, roasted or pan-sizzled with a little oil and garlic. A productive cross called brokali (broccoli x gailon, a tender-crisp crucifer sometimes called Chinese broccoli) produces slender broccolini-type stalks with plump, lacy heads. Harvest the dense, small head of Brokali Apollo and you’ll pick sprouts for months. Brokali Happy Rich is especially vigorous and its pretty shoots can be gathered well into winter. I eat cauliflower pretty much daily, raw in salads, grilled in “steaks’, or roasted with a little avocado oil. Big head cauliflower comes in such pretty colors now, especially Purple Cape, Purple of Sicily, and Graffiti, all good fall performers. Stick-type cauliflower such as Fioretto are a delightful addition, tasty raw with dip, lightly grilled or steamed and drizzled with fresh lime juice. Brussels sprouts are a winter staple in my kitchen. Some are slivered into slaw and raw salads, but most get roasted with cubed sweet potatoes, a handful of raw cranberries tossed in for the last 10 minutes. Red sprouts such as Red Ball never seem to get bugged by aphids, while sturdy Jade Cross and Roodnerf are strong growers that shrug bugs aside. I’d grow Hestia sprouts just to honor the goddess of the hearth, but these plump, tight little sprouts taste sweet even without the usual nip of frost. Wrapped in ruffles and tinted with rosy pink and purple, Kalettes are the rock stars of the cool season garden. Crosses between kale and Brussels sprouts, kalettes offer both delicious foliage and gorgeous little frilly balls, like sprouts in evening gowns. Autumn Star crops first, followed by midwinter Mistletoe and late winter Snowdrop. 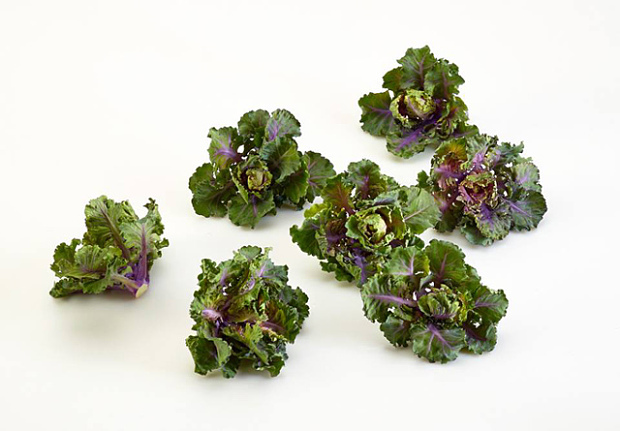 Flower Sprouts Petite Posy is similar, with mild, flavorful little sprouts that taste even better after a light frost. Plus? They’re adorable! This entry was posted in fall/winter crops, Garden Prep, Planting & Transplanting, Sustainable Gardening, Sustainable Living and tagged Autumn Crops, Broccoli and Brokali, Cold Season Crops, Cool Season Lettuces, Endive In Autumn, Fall Planting, kalettes, Red Brussels Sprouts. Bookmark the permalink. Ann, I have never heard of rosy arugula! I’m intrigued but can’t seem to find a source of such seeds. Do you know who sells them? Thanks! This column on winter crops has inspired me to put more thought into them this year. Hi Beth, Red Dragon arugula has bright red veins that give it a rosy glow, as does Dragon’s Tongue, which has a nice bite as well. Is there a local source of fall vegetable starts? I never see any once the spring starts are gone. Check with your local independent nursery and see also the list of retailers of Log House Plants on the home page of their website. If you don’t find starts, ask your favorite nursery to order some! This is not specifically related to cold weather crops but I can’t figure out how to submit a general question so here goes: Can we eat the ‘wild’ green onions that are growing every where in my garden? We are constantly pulling out the tiny bulbs because they are taking over one of our beds and they smell very onion-y. Since we don’t use any chemicals in our garden, it seems like we should be able to eat them. Thoughts? I’d let a few bloom to see what kind of onions they might be. Many ornamental onions self sow abundantly, as do all sorts of chives and of course if you’ve ever grown cooking onions and let a few go to seed, that might be the initial source as well. While there are a few non-edible wild plants that resemble wild onions (as do infant daffodils, which are toxic), they don’t smell like onions. According to several forager’s guides (including Peterson’s Field Guide), all alliums are edible but the quality and flavor can vary a good deal.